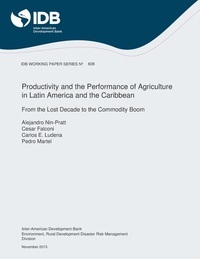 This study analyzes the performance of Latin America and the Caribbean's agriculture between 1980 and 2012 looking at the contribution of inputs, and total factor productivity (TFP) to growth in output per worker. A growth-accounting approach that goes along the lines of neoclassical growth accounting combined with Data Envelopment Analysis, allows us to measure TFP growth using output and input indices and also to decompose this growth into contributions of technical change and changes in technical efficiency. Our findings show that between 1980 and 2012, regional agricultural output per worker and TFP increased 82 and 45 percent, respectively, reducing the difference between TFP in LAC and in OECD countries. This improved performance of agriculture was the result of fast growth in the use of fertilizer, increases in land productivity, and growth in the use of capital that expanded cultivated area per worker. Higher productivity of the animal stock, fast growth in the use of feed and in the number of animals per worker, have increased the share of livestock in total output and also contributed significantly to the improved performance of agriculture. Observed growth patterns at the country level suggest that countries that increased input per worker have increased TFP at a higher rate than countries with limited access to capital and land. As a result of these growth patterns, the improved performance in the region has amplified differences in labor productivity between countries. Growing differences in labor productivity and the fact that the favorable shock in commodity prices that benefited LAC's agriculture in recent years has apparently ran its course, raise concerns for the future.